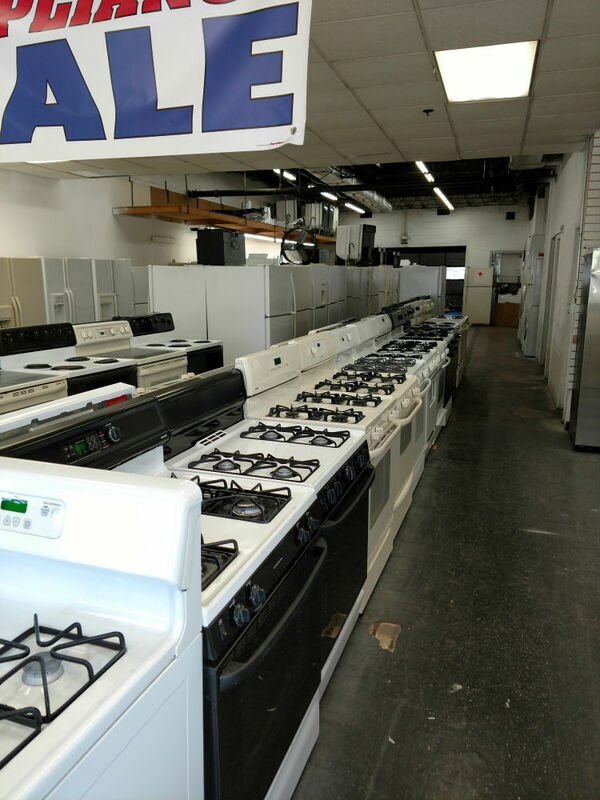 PG Used Appliances gives you a wide choice of used gas stoves. A used stove is made up of two parts. The top has several names, range, cooktop or stove top. The other part is the oven. Normally these two parts are together as a stove but sometimes there is just a cook top on an island and then there is a wall oven. 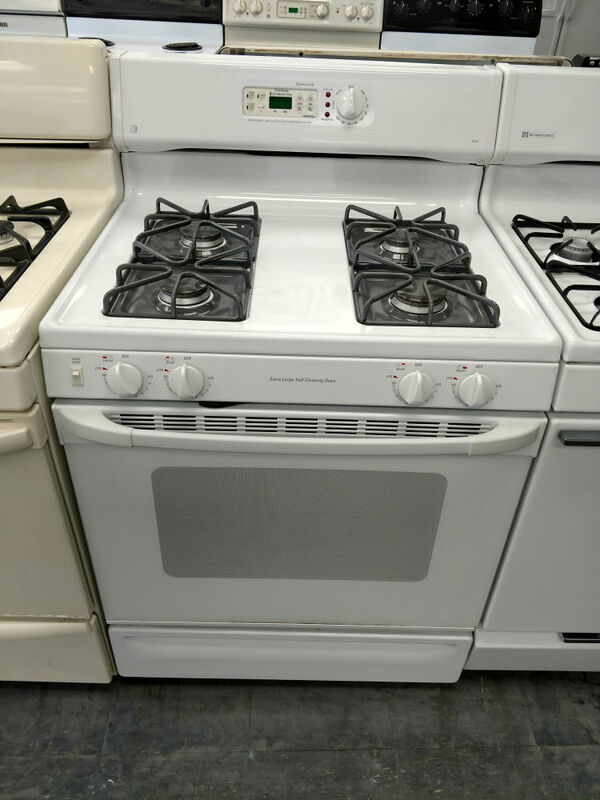 Some people feel that gas is best for the range / stove top and electric for the oven. There are some stoves called dual fuel stoves which have a gas range and electric oven. We don’t see many of those as used appliances. 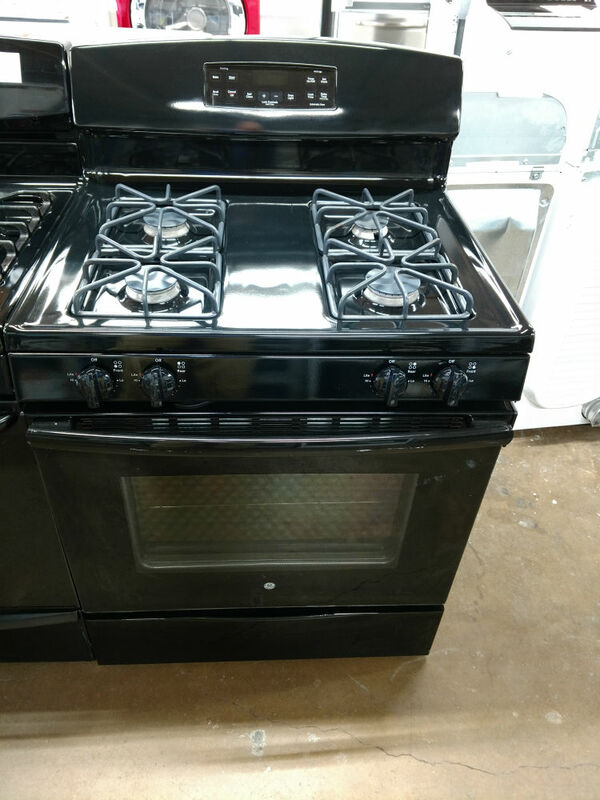 Most of our inventory is used electric stoves and used gas stoves. Due to the low cost of gas, gas stoves are cheaper to operate then electric ones. The savings can be in the 10 – 30 per cent range. You get the temperature you want immediately when you turn it on. Gas stoves continue to work when the power goes out as long as you have matches to light it. Experts say that gas gives a faster and more even cook even though this doesn’t seem obvious to us. If the temperature is the same, why a difference? Gas ovens can make it harder to get consistent baking results because the heat is not as evenly distributed as in an electric oven and the gas gives off moisture but baking is better in dry heat. With an open flame, there is a greater chance of a fire. There is also the possibility of a gas leak. Gas stove tops can be harder to clean because of the grates. Gas stoves are usually more expensive to purchase even though cheaper to operate. But you can get some great deals on our used gas stoves. The downside of the infinite choice of heat on the cooktop is that getting the same heat every time can be harder. Gas usually can’t get to as high a temperature as electric heating elements. Gas stovetop tip: A lot of people feel the bigger the burner the better. It will cook faster. WRONG! You need to match the burner to the pot or pan. If the burner is too big, most of the heat goes up the sides of the pot or pan and it is very inefficient. You need to use a burner that is smaller than the diameter of the pot so that most of the flame is hitting the bottom. The number of burners on the cooktop varies. Lower end, standard models have 4 burners. Premium models will have five or six burners. Removable cooktop griddles are another option. For the oven part, the standard stoves have an oven with two racks. Higher end models have 3 racks and the ovens are larger. Many ovens have a storage bin underneath the oven. Finishes include stainless steel which tends to be more expensive as well as white or black porcelain finish. Another option available is self-cleaning ovens. No one has figured out a self-cleaning cooktop although that would be nice. More expensive models have an oven that can run as a convection oven which cooks faster. These higher end models will also have hidden heating elements in the oven which makes cleaning easier. 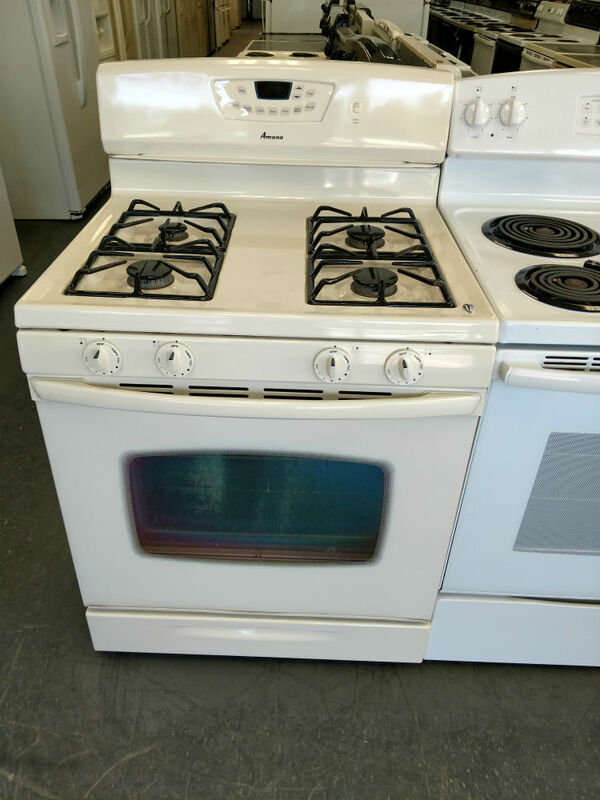 PG Used Appliances has a great selection of used gas stoves for you to choose from. 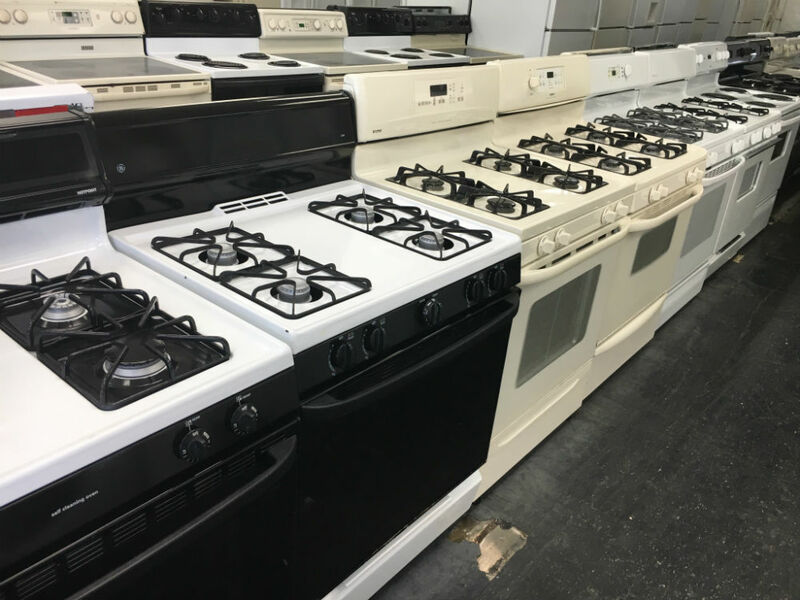 Come and see us about gas or electric stoves as well as used refrigerators, used washers and dryers, used wall ovens, used dishwashers, and used microwaves. We are in Lanham, MD but serve Bowie, MD, Silver Spring, Bethesda, Greenbelt, Laurel, Landover, Hyattsville, Temple Hill and Washington DC. Contact us at 301-231-1923.